After learning about the life and works of William Pryor Letchworth, one might assume that his mortal remains would rest beneath an ornate monument - a fitting tribute to a man of his importance and means. But as you will see below, such is not the case. 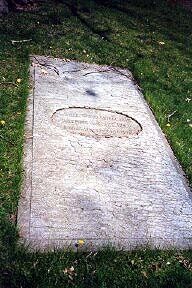 Mr. Letchworth, the great benefactor who gave us the Park that bears his name, sleeps beneath a simple, but special stone. Why such a simple marker for such a remarkable man? Why isn't he buried in the Park with an elaborate stone, perhaps embellished with his statue? First of all, perhaps because of his Quaker background, Mr. Letchworth was never one for ostentation. His Glen Iris, for example, was enough of a mansion for his taste. It is also likely that Mr. Letchworth saw his Glen Iris Estate - the new Letchworth State Park - as the real monument to his life and work. No statue is needed - just gaze at the Middle Falls, and you will be reminded of the remarkable man who preserved the Portage Falls for generations to come. 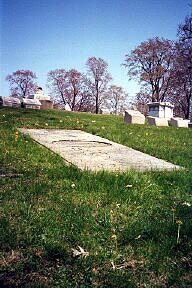 Special thanks to Dawn Brooks for visiting Mr. Letchworth's Grave in Forest Lawn Cemetery and giving us permission to use her photographs! 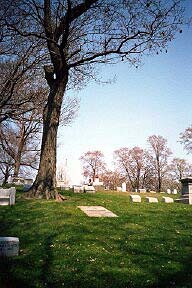 Also, go to our links page to find the link to the Forest Lawn Cemetery Web Page.